I recently found myself in a bout of depression, which is very unlike me. In fact, after being lifted above that dark cloud, I had a new compassion for those that suffer from that physiological state. I learned through all of this that emotions are a result of thoughts and that there is a cycle that first begins with thoughts -that leads to emotions- that leads to action. I heard a wise man liken raging emotions to a runaway horse. 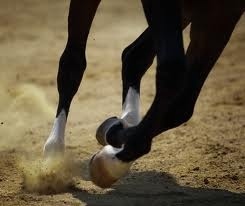 It is nearly impossible to control a runaway horse once it is in a full sprint; one is at the mercy of that horse. But, consider this example of a young child controlling an untamed adult horse. If that young child could keep his foot on top of the horse’s head as the horse lays down, that horse could not and would not be able to stand up, even though the horse was much heavier and larger than the child. The reason this is possible is because a horse has to lift its head before it can stand up. It takes little to no effort to keep that horse’s head down, but is impossible to stop it once it stands and runs away. This is much like our emotions. If we can learn to control our thoughts, we can control our emotions. So how can we control our thoughts? I surly am not an expert at this, but I am not where I used to be. They key is to be God-minded. To learn to exchange our thoughts with God’s Word is key! You say, “It’s too hard.” I feel like saying that too:/ In the movie soul surfer, young surfer Bethany Hamilton tells her father (after her arm was taken by a shark and she decides to surf again competitively) she wants to surf again. She tells her father, “I don’t need easy, I just need possible!” Controlling our thoughts isn’t easy, but definitely possible! The key to controlling our thoughts is the Spoken Word. Did you know that you can not think about something different than what you are speaking? Try it! Therefore, if we speak God’s Word, our mind is forced to think about It. This results in a change in our emotions followed by a change in our actions! Wow! That sounds so simple; that sounds like a formula…. Which should appease you type A people like me. I need things spelled out for me. So let’s recap. 1. Find out what God’s Word has to say. 2. No matter what your situation or emotion, begin to speak God’s Word out loud over that situation. 3. Read It, Pray It, Say It, and Think It until peace rules your heart and it overflows with thanksgiving…. Your emotions and actions will follow.